Originated in Damascus, Syria more than 2 000 years ago, borrowed by the Arabs and brought to Spain, Damascene technique has reached our days. 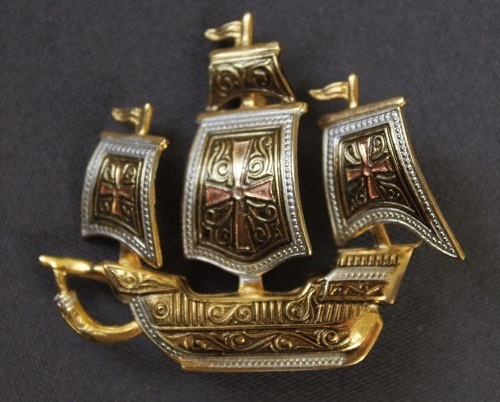 This technique, in particular, was the art of incrustation of various metals into each other, and most often gold or silver into a copper, steel or alloy basis. Meanwhile, to Japan, the art of damascene got through the Silk Road in the period between 710 AD -794. 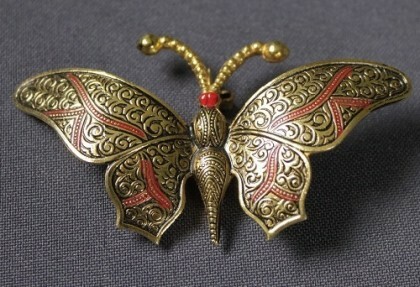 It achieved a great popularity in Kyoto during the Edo period (1603 – 1868), when masters decorated handles of weapons. 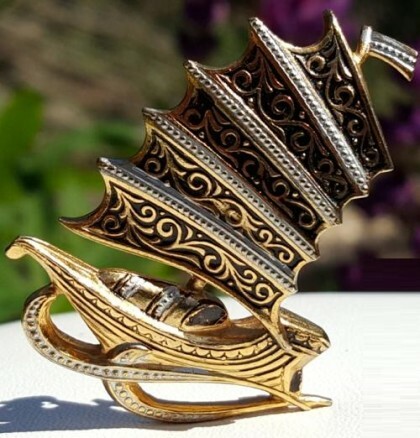 However, due to the fact of banning of swords in Japan, the masters used their skills in the manufacture of accessories and jewelry. Their art reflected traditional motifs – flowers, birds, sakura, landscapes, and Mount Fuji. 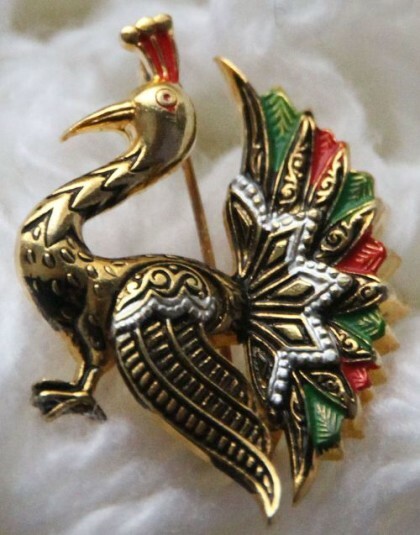 By 1936, more than half of the manufactured Damascene products had been exported mainly to the United States and England. 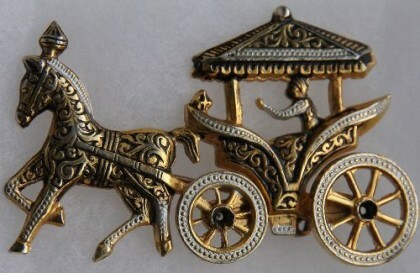 Brooch ‘Ship’ made in the technique of painstaking and time-consuming art of Damascene. 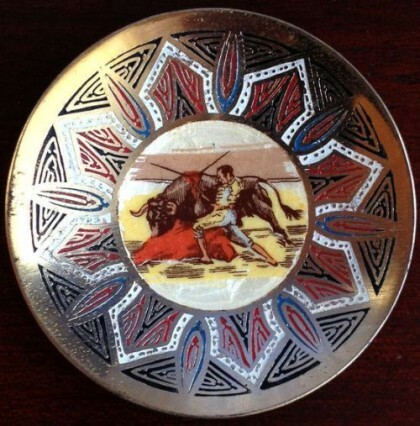 With steel tools or by etching on the surface, the image stands out. Next is the process of fine gold wire inlay on a pre-engraved image. 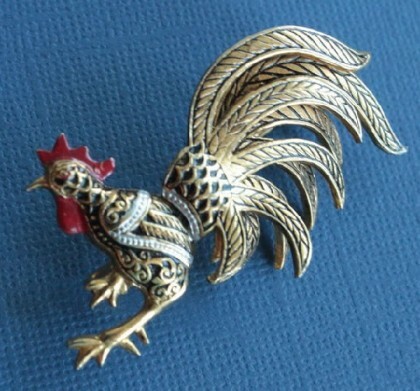 The relief of the image laid out and secured, but in fact, hammered in the engraving of the precious metal. The next step – the oxidation or browning and heat in the oven, in which the surface becomes dark, and the drawing – a convex and contrasting with the surface. Then comes the process of chasing the bas-relief, by which figure gets relief, later polished to a shine. 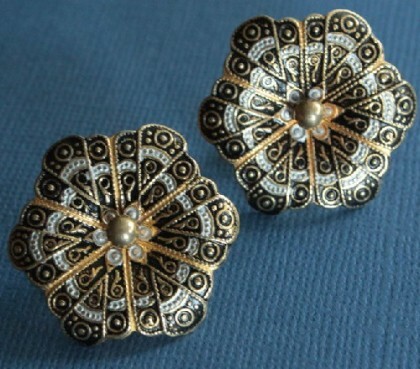 Finishing products includes giving elements various shades, covered with enamel, giving a matte or pearl effect. 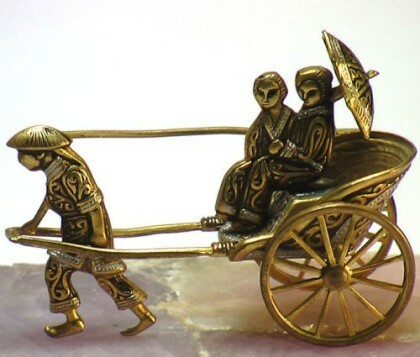 In 1936, in Yokohama, Japan, was published a book, which described the painstaking, lengthy and difficult process of making objects in the technique of Damascene. According to the book, the master was sitting cross-legged in front of a low bench. Design of pattern then transferred to the tissue paper with thin chisel. With the delicate touches, the patterns were then engraved into templates. 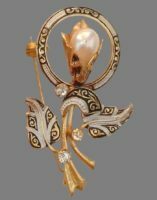 Very fine gold and silver threads were then gently hammered into the grooves, and with the tool of deer horn smoothed surface of the product. Then followed a process of oxidation by nitric acid, and after drying, the master washed the product twice with salt water and then quenched with fire. Noteworthy, the craftsmen repeated the process of washing and baking eight or nine times a day for five days! Thereafter, the process of immersing the product into red mud, and baking repeated 50 to 100 times to form a varnish coating. Next, the masters coated surface with charcoal powder and oil, and baked again, 10 or 20 times! And finally, they cleaned the surface from a black powder, rubbed and polished. 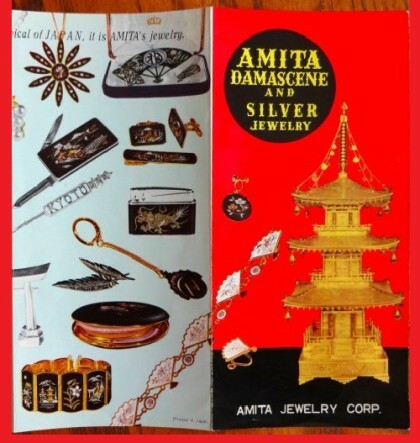 Somewhere in the 1960s, the Amita Jewelry Corporation of Kyoto published an undated brochure on jewelry technique Damascene, made in their company. The manufacturing process was very similar to the 1930s. 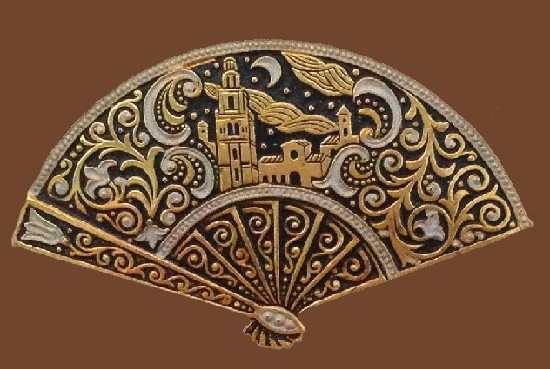 In Spain, the art of Damascene appeared when the Moors conquered the territory of modern Spain, with the result that the Spanish masters adopted the technique of Damascene. The centre of Damascene is Toledo. Spanish damascening method is very similar, but slightly different. The work is usually done on a small surface. Precious metals are placed in the grooves and hammered with a small hammer. Black background is created by the oxidation of a very hot solution. 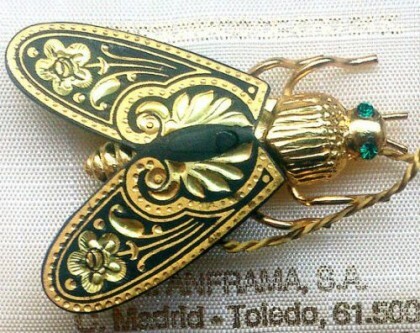 The Spanish technology used 18 and 24 carat gold. 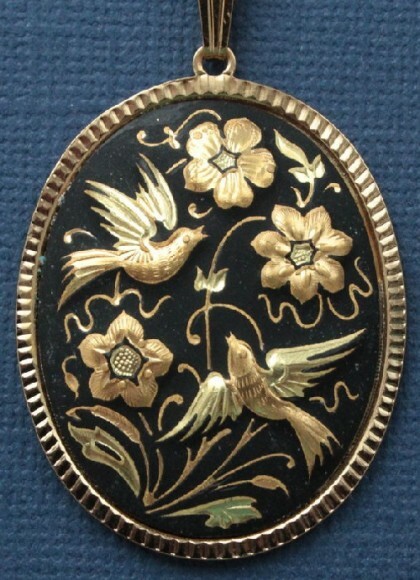 We must not forget, and be able to distinguish Spanish technique Damascene, from its imitation – moldings, painted in black and gold tone. 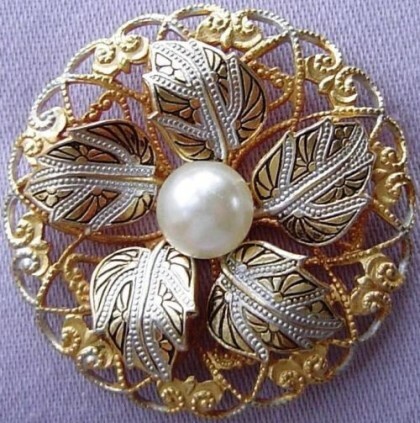 Such articles are certainly beautiful, made by hand and do not contain precious metals. 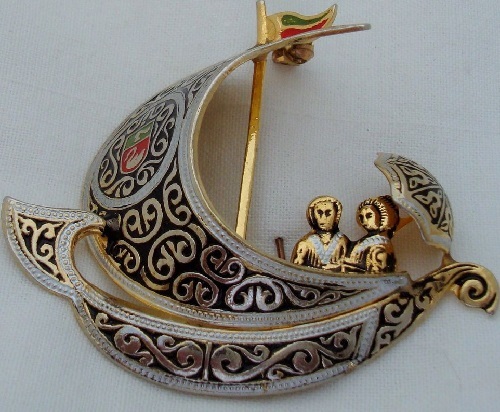 Very unusual, refined brooch with a variety of elaborately worked details. 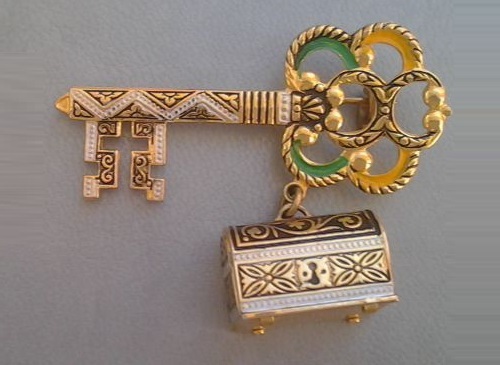 The top of the key is decorated with openwork green and yellow enamels, and chest-suspension of three-dimensional design. 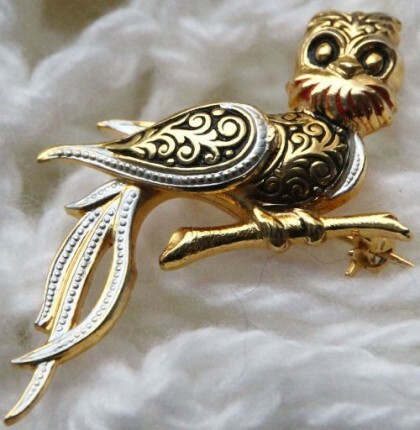 The complex geometric patterns and floral ornaments, realistic keyhole and legs at the casket, all of stunning quality work of Wizard – this is the secret charm of this brooch.